Two price cuts in two days for the same yacht is the news from Frank Grzeszczak and Chany Sabates at International Yacht Collection who tell me that an additional $1 million has come off the asking price of the 49.07m motor yacht Anjilis. Built by Trinity Yachts in 2009, she sleeps 12 guests in a master, three doubles and a twin along with accommodation for up to 10 crew in five cabins. ABS classified and MCA compliant, she has a Glade Johnson interior and a very large swim platform/beach deck and, of course, zero speed stabilisers to ensure comfort at all times. Following her cut to $29.9 million yesterday, Anjilis is now asking $28.9 million. 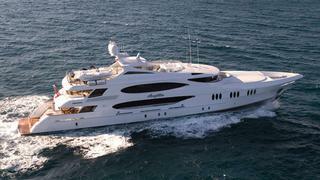 Currently en route to Florida she will be on display at the Fort Lauderdale International Boat Show next week.